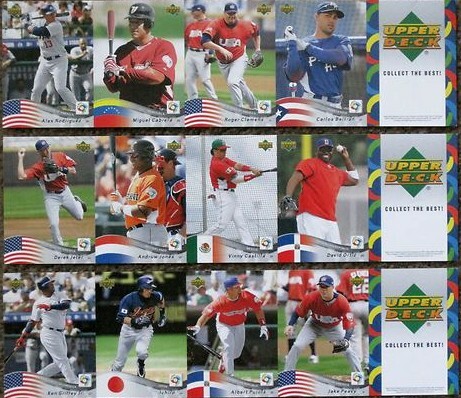 Complete set of 12 2006 World Baseball Classic Upper Deck promo cards in 3 strips of 4 cards each distributed exclusively at the final game played in San Diego. Includes Miguel Cabrera, Roger Clemens, Ken Griffey Jr., Derek Jeter, Andruw Jones, Albert Pujols, Alex Rodriguez and Ichiro Suzuki. Average ExMt/NrMt condition. ONLY ONE SET AVAILABLE FOR SALE.